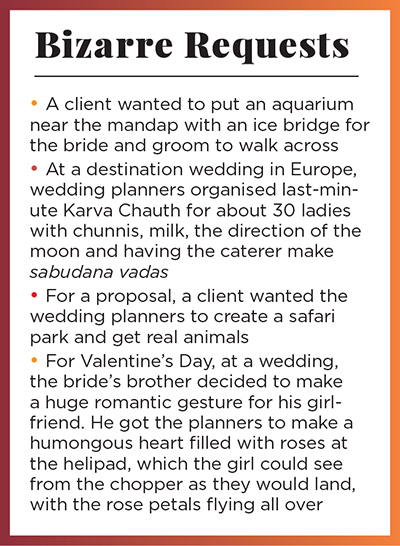 A few years ago, for the wedding of a patriotic Indian-origin businessman’s daughter, wedding planner Aditya Motwane made a proposition that floored his client. “Just when the sindoor was being applied, we made three fighter jets fly past with the Indian tricolour dust behind,” says Motwane. The client didn’t know it was going to happen. “We were on walkie-talkies and in touch with the air traffic control. I was talking to someone, who was in touch with someone from the military, who was in conversation with the pilot on top… it was a challenging thing, and it had to happen at that time. We were delayed by three seconds…the groom put the sindoor and from behind we started playing AR Rahman’s Vande Mataram. Just then, the flights went up and down and did two rounds. Every guest had tears in their eyes, and the bride’s father hugged me,” he recollects. Celebrity weddings make it to the limelight, but a fly-past is the sort of grand gesture that takes the big-ticket Indian wedding into another league. A league that involves buyouts of entire hotel inventories at destinations or even cruise ships, flying down chefs and artists from all over the world, and setting up massive sets that resemble cities. Where costs might start at ₹1 crore to ₹1.5 crore, with no upper limit. “There is a lot of hype around celebrity weddings,” says Trishant Sidhwani of wedding planners Dreamzkraft, which has worked on the weddings of actors Lara Dutta and Preity Zinta. “And rightfully so. People want to know what they did.” But those are probably basic weddings. “At Lake Como, Italy, people took vows, did their pheras, had 80 people, 40 rooms. There are people who do 800-room weddings. There’s a lot of stuff that people do…they fly down chefs from Dubai to do their Arabic counters, from Lucknow, Hyderabad, Delhi, Agra…there are parathawalas coming in from Agra.” Not to mention blue lassi from Banaras. “Means people go crazy, they will then set up their food counters with different chefs coming in from all over the world.” And that’s just on the food side, he says, adding that he had a client who wanted to do a Jaipur wedding, but it wasn’t working out logistically. “They had 1,500 people and the number of available rooms was a problem.” So they brought Jaipur to Mumbai, recreating an entire set of Jaipur at MMRDA Grounds. “It was a three-month-long production for us. There was work going on in my godown for three months. Every pillar, every engraving, everything was freshly made for them to create that set-up because they wanted to get married in Jaipur,” says Sidhwani. 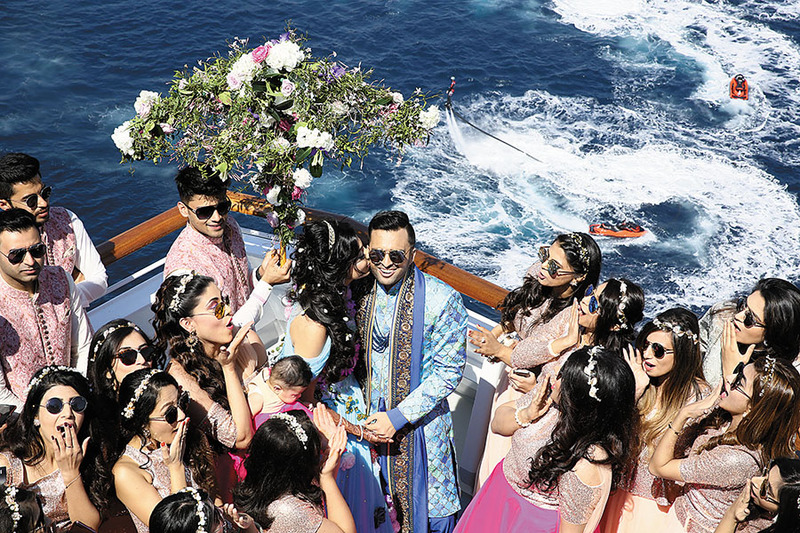 When a Dubai-based client had his heart set on a Bollywood-themed wedding based on the 2015 film Dil Dhadakne Do, wedding planners Wedniksha bought out an entire cruise ship for three days for the April 2017 marriage. “Normally, people take a part of a ship…here we had the full cruise ship for 1,250 guests. Each guest was given two bedrooms, one for luggage and one to sleep in. We had 75 chefs flown in from India and decorated the Barcelona harbour because that’s where the guests came in,” says Bhavnesh Sawhney of Wedniksha, who had to resolve logistical issues like the route the ship would take, the ports the artists would board at, and flights and boarding cards for everyone. “It took about four months of planning for the entire wedding. The venue, the cruise ship, at the time was sailing in Brazil so we actually flew to Brazil in January to do a recce of the ship and cruised for three days on it, to understand our venue,” says Sawhney. There were performances by Badshah, Vishal-Shekhar and Meet Bros on the ship. Sawhney also recollects Sanjay Hinduja and Anu Mahtani’s wedding in Udaipur in 2014, where celebrities like Nicole Scherzinger (then with Pussycat Dolls), Ranveer Singh, Malaika Arora and Arjun Kapoor performed on the first two days, while Jennifer Lopez was flown in for a 50-minute performance on the third day. Motwane, director, Motwane Entertainment and Weddings (MEW), says that while international artists do get booked, Bollywood often trumps even the likes of Justin Bieber and Elton John. Weddings have been family affairs, a time for the entire joint family to get together, where various people are put to work and given specific tasks. But when the logistics involve booking 500 cars and artists such as Jennifer Lopez, it’s no longer a job for an uncle or a nephew. “Fifteen years ago there was nothing like a wedding planner,” says Mahesh Shirodkar, managing director of Tamarind Global. Shirodkar was a tour operator with hospitality, destination and logistics expertise, who happened to fall into the wedding space when a friend asked him to plan his daughter’s wedding. Shirodkar thought it wasn’t going to be different from any other event. The first itself turned out to be a baptism by fire. “We booked 500 rooms at Hotel Trident in Mumbai and 500 cars, the wedding was spread over four days and five venues. There was a reception at the Turf Club with 2,800 people. We got the Imperial Circus of China and fused it with Shiamak Davar at the National Centre for the Performing Arts (NCPA). It was not a big fat wedding, it was an obese wedding.” Since then he has done big weddings in obscure locations like Azerbaijan, Malaysia, Moscow, Israel and China, among others. Vandana Mohan, who introduced luxury and lifestyle to corporate events, applied the same formula to weddings when she incorporated the Wedding Design Company 18 years ago. “When I started out I decided to charge a management fee. Now, nobody had ever charged a management fee. Even I had no clue. I only knew what corporate was like. And corporate is charged at 17.65 percent; we charged a management fee like advertising used to,” she says, adding that that figure died pretty quickly. “Nobody is paying us 17 percent of whatever it is,” she says. Numbers depend on several factors and could range from five percent to 12 percent, with an average of seven to eight percent. Though event management company Wizcraft had always been doing weddings as an extension of their events business, five years ago they decided it was big enough to have an entire division focussed just on weddings. “We are the ones who are stitching the whole affair together. It is a lot of hard work with almost no [fixed] working hours. 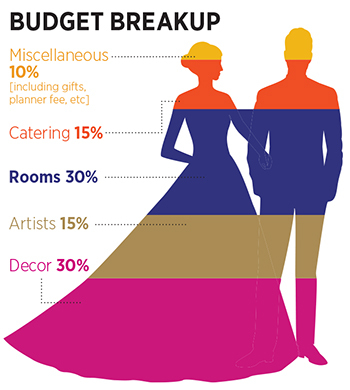 The amount of work that goes into a wedding will never come to what people are willing to pay for.” The profit margins, according to Sawhney, range from 10-15 percent, most of which goes as salaries, which are pretty high for creative spaces like weddings. “It is an industry that really kills you. You have no personal life and you are living in your office or on an aircraft,” says Mohan. Or as in the case of Puri, waking up at 5 am to go check out the venue with the client and having to make 300 sofas just seven days before the big day. Weddings are recession-proof, more so when the clients are billionaires. But they don’t seem to be policy-proof. While policy changes like demonetisation (in 2016) and Goods and Services Tax (GST, implemented a year later) didn’t have a direct effect on the business, with liquidity becoming a problem, it made people more careful about their spending. Things started to scale down. “There was definitely an impact initially. Families are far more careful where they are spending their money. 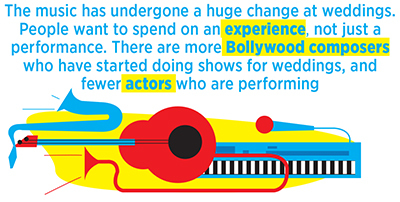 They want to know how and where it will be spent,” says Punit Jasuja of Punit Jasuja Productions who got into the industry nine years ago with a wedding in Khimsar for a Maharaja, and hasn’t looked back since. He adds that the big weddings in the past year, “have made people more aware of things they can do at their weddings, and opened their minds to new traditions and ideas for celebrating”. She realised that every project she got was not a four or three-day wedding. 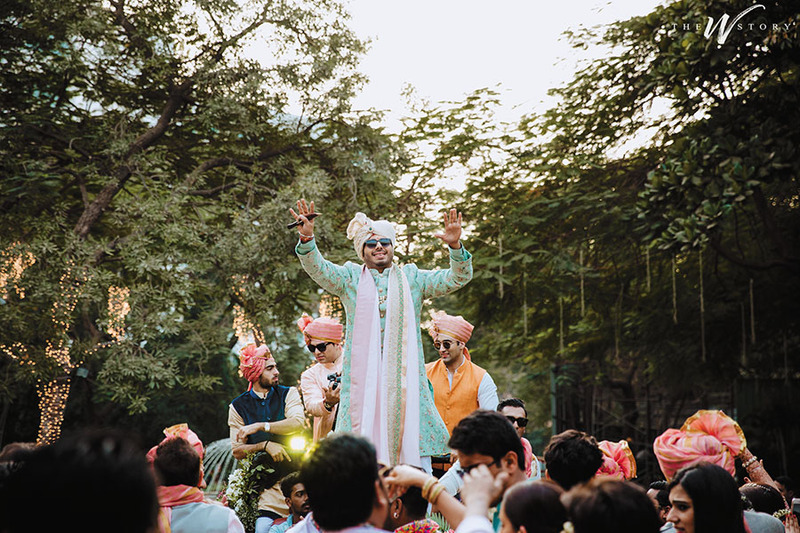 “People were saying let us do the wedding small and a big sangeet, and keep the mehendi simple. Keep one thing big. There’s no need to do a three-day thing. So, the two-day concept started in 2017,” says Mohan who does about 10-15 weddings a year.